OxyMask is the One Mask from admission to discharge! 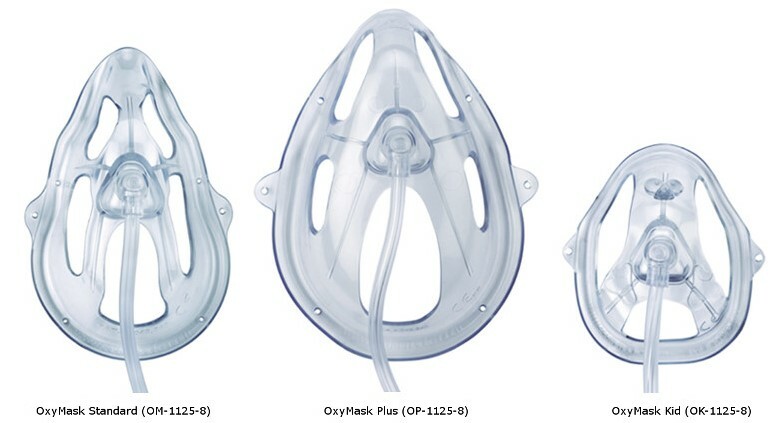 The OxyPlus Mask is larger in size compared to our other product: OM -1125-8. OxyPlus is 25% larger than OxyMask for the man with facial hair, larger profiles or some stroke victims. The ONLY mask that can supply oxygen at low flow. This mask works great for patients that use oxygen concentrators. Flow Rate - 1 liter per min. - 15+ liter per min. This unique product can be used to replace Nasal Cannulas, Simple Masks, Partial Rebreathing Masks, and Non-rebreathing Masks. Can be utilized to deliver High Flow O2 Therapy up to 40L/min. I am a mouth breather so it was apprecitated. Very responsive. Notified immediately that it was out of stock. 2-week delay or did I want substitute. Waited & it arrived in timely fashion. Will use again. Excellent product, fast shipping. Will definitely purchase products from this company again!